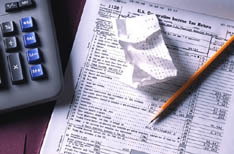 Please contact us today for a complete preparation of your taxes. Our rates are reasonable, our staff is friendly and competent and we are dedicated to getting you the biggest refund legally possible! As working professionals, we understand you have a busy schedule so if you can't make it into our office, we will be more than happy to come to your home or office!